Landmark study's second edition reveals that continued convergence of marketing and PR will have serious implications for both in-house comms execs and PR agencies. 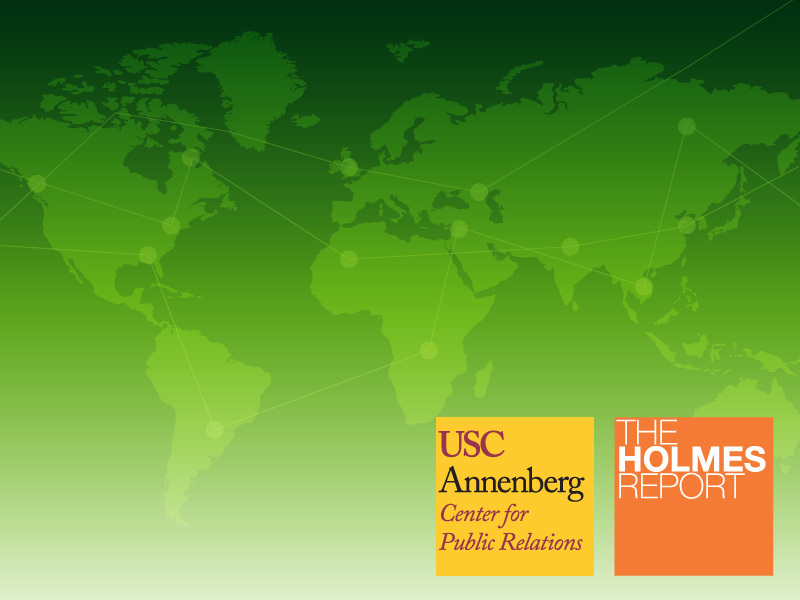 LOS ANGELES—The continued convergence of marketing and public relations will have serious implications both for in-house corporate communications professionals and for PR agencies, according to the 2017 Global Communications Report, the second collaborative research project between The Holmes Report and the USC Annenberg Center for Public Relations. The landmark study polled more than 800 public relations executives from around the world. For the first time ever, the Report also features insights from almost 700 public relations and communications students, along with in-house marketing executives. Almost half (47%) of public relations professionals responding to this year’s survey believe PR will be more closely aligned with marketing over the next five years, with an additional 6% saying PR would become just a subset of marketing. About 12% said they expected PR to play a dominant role over marketing, while just 7% of agency professionals and 12% of in-house practitioners said they expected PR to be a distinct and separate function. The survey was expanded this year to include marketers, who were even more likely to see convergence in the years ahead: 61% say PR will be more closely aligned with marketing; 20% believe PR will become a subset of marketing; and just 5% think it will be a distinct and separate function. That matters because while PR agencies expect their firms to grow by a cumulative 30% over the next five years (slightly lower than last year’s estimate of 33%), in-house PR people expect to see just 12% growth (down from 13% last year) in their budgets. It’s clear that the significant difference between those two numbers is based on the belief that agencies will receive more marketing dollars over the next five year—although agencies may be over-optimistic on that score. While 92% of agency respondents said they expected PR spending by marketing departments to increase over the next five years, only 43% of marketers agreed, with a slightly higher number (51%) expecting PR spending to stay the same. The good news for PR agencies is that both in-house communicators (69%) and marketers (67%) cite strategic insights as one of the critical reasons for working with PR agencies, while similar numbers (69% of in-house PR people and 64% of marketers) cite creative thinking. And large numbers of marketers value public relations agencies for their expertise in specific practice areas (63%), media relations capabilities (62%), digital and social media expertise (60%), measurement and evaluation capabilities (60%), and expertise in reaching diverse audiences (48%). There was significantly less confidence (34%) in the data and analytics capabilities of PR firms. More interesting, perhaps, are some of the subtle differences between how PR people and marketers see the future. PR people believe that digital storytelling is the most important trend for the future, cited by 88% of respondents. But only 80% of marketers agreed; they were more likely to value social listening (88%) which was cited by 82% of PR people. Marketers were also more likely to see influencer marketing (68% to 64%) and real-time marketing (69% to 62%) as important trends. There was broader agreement, however, about the importance of social purpose (71% of PR people and 73% of marketers). Finally, there is little evidence that increased alignment between marketing and PR is impacting in-house reporting structures at this point. More than half (55%) of in-house respondents say they report to the CEO or president, while just 18% report to marketing (strategic planning, human resources and operations each account for 4% of reporting relationships). On the agency side, meanwhile, only 21% say their typical reporting relationship involves marketing, although another 12% say they report primarily to brand management. The largest number (39%) report to corporate communications, with another 22% reporting to the president or CEO.